Every summer thyssenkrupp Engineered Plastics takes on summer interns and the summer of 2017 is no exception. This year we are fortunate to have two exceptionally talented students, Jovan Sanson and Kristy Lazarowicz. In their time here at tkEP each one will be working within their chosen field of study to get real world experience you can’t get in a classroom. For us, we look forward to the fresh ideas and tools they bring with them from all their recent classroom experience. Jovan is from the Toledo, Ohio area where he is studying professional sales at the University of Toledo’s College of Business. Jovan says he wanted to attend U of T because they have an excellent program, but also because he can continue to contribute to his local community. He went onto explain his involvement on campus through multiple organizations where he has been recognized for his commitment to leadership and service at a local and national level. He is currently in the process of creating a student organization that gives back to the Toledo community by going into inner city high schools to teach about professional skills that are needed for the work force. Kristy Lazarowicz is a senior currently attending Oakland University. Her area of study is Human Resources and in her time here at tkEP she will be tasked with developing a formal training program for new hires in the Sales Department. Kristy says she came to study Humans Resources through “a lot of soul searching. In all the different areas of study I looked at I realized that what I wanted most was to do something that helped people within business and helped businesses reach their goals.” Kristy went onto say “When I first came across the thyseenkrupp Engineered Plastics internship ad I just smiled because this was everything that I hoped for. I had a background in training and wanted to work for a global company that gave me lots of opportunity. 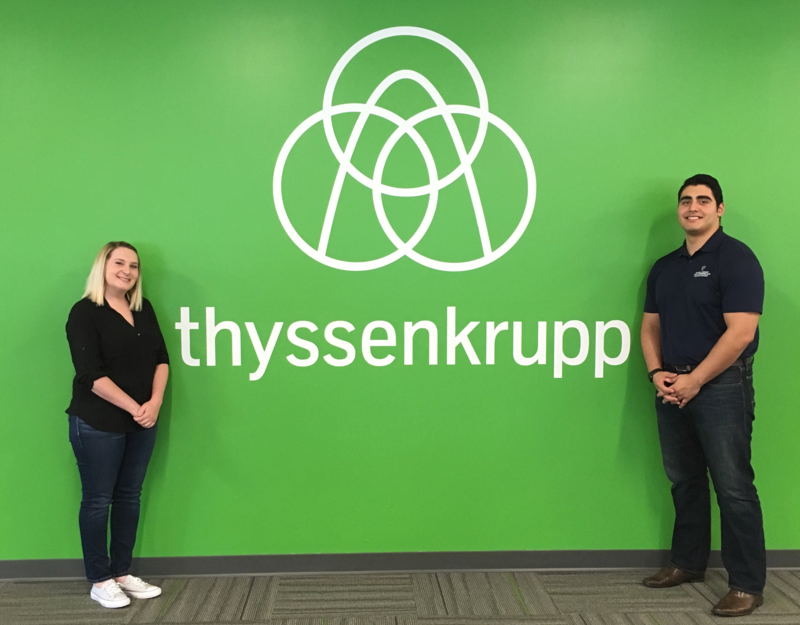 I am now the thyssenkrupp Engineered Plastics new Training Intern.” As an outdoor person Kristy is looking forward to the tkActive activities the company participates in throughout the summer. Please join us in welcoming Kristy and Jovan here to tkEP. We look forward to the new things they will bring to everyone and to sharing the knowledge we all have of the plastics industry. This entry was posted in About tkEP on June 22, 2017 by ainadmin.